The cake must have been delicious. Teddy is not normally super obsessed with food, however, with his peanut butter cake- he almost refused to share with his doggy siblings. I will definitely be ordering from here again–yearly for Teddy’s birthday and for any other occasions. Both the food and the people are lovely. Thank you, Le Marcel!! 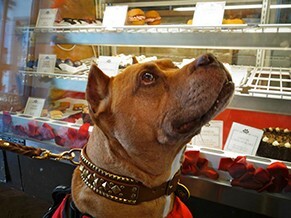 This is a really surprising shop where you can find the best treats for your dog, all the cakes are unbelievable human desert looking and well presented. Plus, they provide nice service. A top notch doggie store. Will come back to visit again. Most adorable and high quality dog treats! 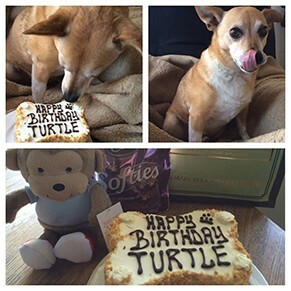 Perfect for a dog’s birthday, Yappy Hour, doggie park date….everything and anything. The presentation is impeccable, and Le Marcel’s creations wow me every time. Highly recommend if you’re looking for a special something for your or a friend’s little furry friend! My little guy is one of the pickiest eaters on planet, so I was unsure when we stepped into this bakery (even though the treats are GORGEOUS). 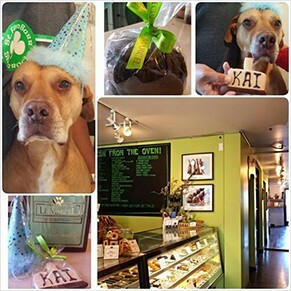 The guy behind the counter starting handing over the samples and in seconds, my dog was going nuts. We left with a ton and I even got him a super sweet new collar. So awesome!! Have a testimonial or picture for our wall of fame? Just submit it here!